This beautiful bride and groom selected the Cleveland Cultural Gardens as the location for their wedding photography. The Cleveland Cultural Gardens are an extremely popular wedding and engagement photo location. Each garden is themed after different countries. This particular photo was photographed at the Italian Garden. During the summer, many many bridal parties can be seen photographing their images at this location. Also close to this location is Case Western Reserve, The Cleveland Art Museum, and the Cleveland Historical Society. 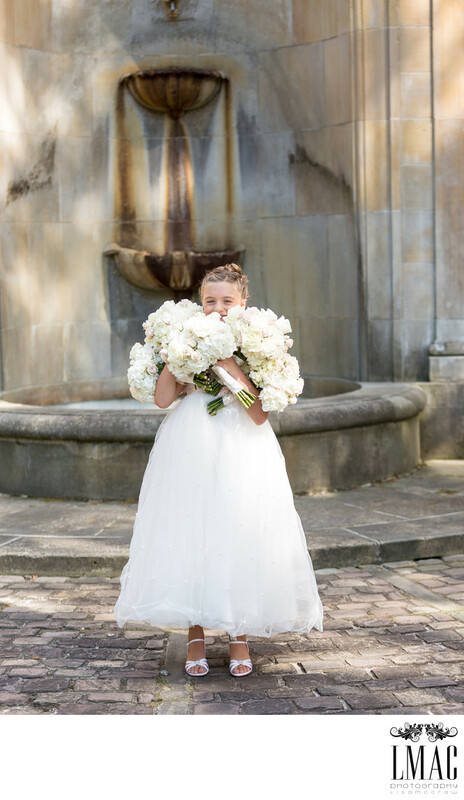 This flower girl was given the task of holding all the bouquet as the rest of the bridesmaids continued with the bridesmaid photos. It's a candid and cute moment, something that LMAC Photography specializes in. LMAC Photography is experienced at capturing sweet candid moments.